Dialog choices and quests also revealed in new 20 minute walkthrough. 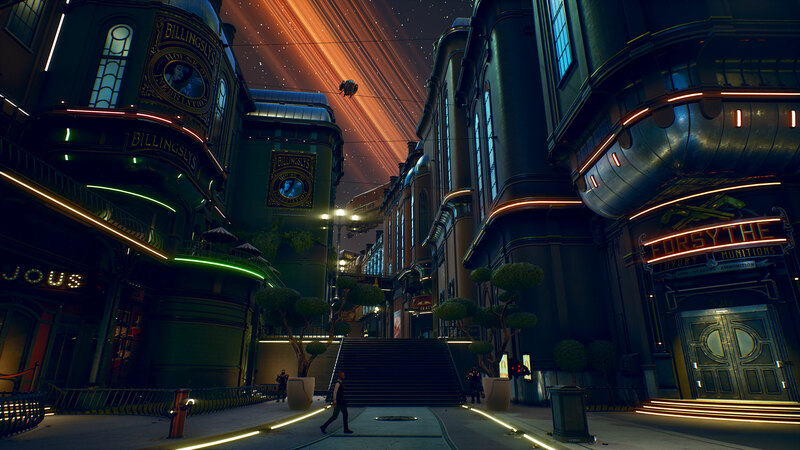 Obsidian Entertainment was in attendance at PAX East 2019 to showcase a hefty amount of gameplay for The Outer Worlds. A demo walkthrough for the first person shooter/RPG takes us through the city of Byzantium, meant for the more well-off citizens of the frontier. Check it out below (courtesy of MrRedRivers on YouTube). Representing the game’s alpha state, the demo showcases how quests play out and how your companions – Nyoka and Felix – act during gameplay. Dialog systems (like remaining “stoically silent” and exuding “wordless fury”), character customization, and much more are also revealed. The combat seems up to snuff, especially with the slow-mo and weapon variety. The Outer Worlds is due to release this year for Xbox One, PS4, and PC. It will be exclusive to the Epic Games Store and Windows Store on PC for a year, releasing for Steam in 2020. For more information on the gun types and Tactical Time Dilation system, head here.